This is the Lincoln School building, a former school of the Joplin R-8 School District, that once stood on the 800 block of East 7th Street. Predating desegregation, it was Joplin’s only school for black students, serving not only Joplin’s African-American community, but often that of neighboring towns. 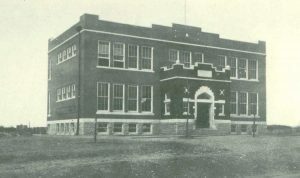 This building was opened in 1908, with primary grades on the main floor, secondary on the second floor, and other rooms, including the dining room, in the basement. The building was updated in 1926, 1930, and again in 1950, just four years before the Supreme Court ruled in favor of desegregation. Following integration, the school was used for special education. It was closed in 1975, changed hands over the years, and was razed to make way for a car dealership in 1988. Lincoln’s rich history–including its association with boundary-breaking community leaders Marion Dial and Melissa Cuther–makes it eligible for recognition as one of Joplin’s Local Landmark sites. Months ago, members of the Joplin Historic Preservation Commission, a representative from the Emancipation Celebration committee, and members of Unity Baptist Church (who currently own the land) began that process. At a recent Joplin City Council meeting a presentation was given encouraging Council to move forward with Lincoln School’s historic designation. Move forward they did; unanimously so! Thus, the nomination process will soon come to a close, making the former Lincoln School site the first Local Landmark site that represents Joplin’s African-American community and the contributions thereof.